Kaitaia is the last major town before reaching the very Northern tip of New Zealand. 'Kai' is Maori for food - and 'Kaitaia' means ample food. Just 15 minutes from Kaitaia, the warm waters of the South Pacific wash into a golden sand bay and there sits New Zealand's hottest crop: 5 acres of organic chili peppers. Kaitaia Fire began in 1989 and since then this flavorful chili pepper hot sauce has grown into a house hold staple in New Zealand and is being exported all around the world. This makes an awesome New Zealand gift or a unique choice for a chili sauce or pepper sauce fan! A TRADITIONAL RED CHILI HOT SAUCE: made with New Zealand grown cayenne peppers which have been lovingly tended using organic principles to produce fiery red fruit. 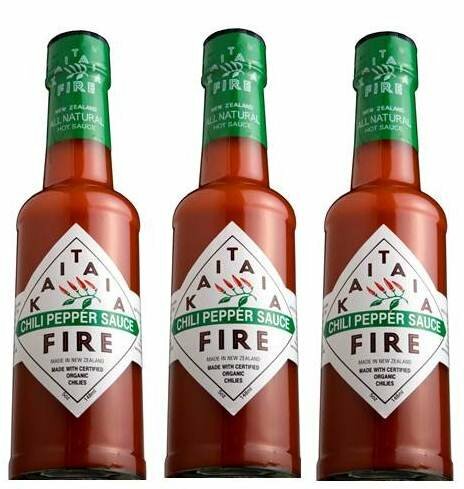 THE CHILI PEPPERS: used in Kaitaia Fire are sun-ripened in New Zealand's far north, finely milled with sea salt and barrel aged to create a superior piquant flavor. The process removes virtually all the sugars in the fruit, and releases the pepper's volatile oils. This is pure Kaitaia Fire. FREE OF: artificial preservatives, coloring and sugar this chili sauce packs a nice hot punch. NEW ZEALAND'S NUMBER 1 HOT SAUCE BRAND: Makes a great New Zealand gift for a New Zealand food fan! LIFT ANY CULINARY EXPERIENCE OUT OF THE MUNDANE: and into the realms of the unforgettable. This is the sauce that will replace the one in your handbag. If you have any questions about this product by Kaitaia Fire, contact us by completing and submitting the form below. If you are looking for a specif part number, please include it with your message.